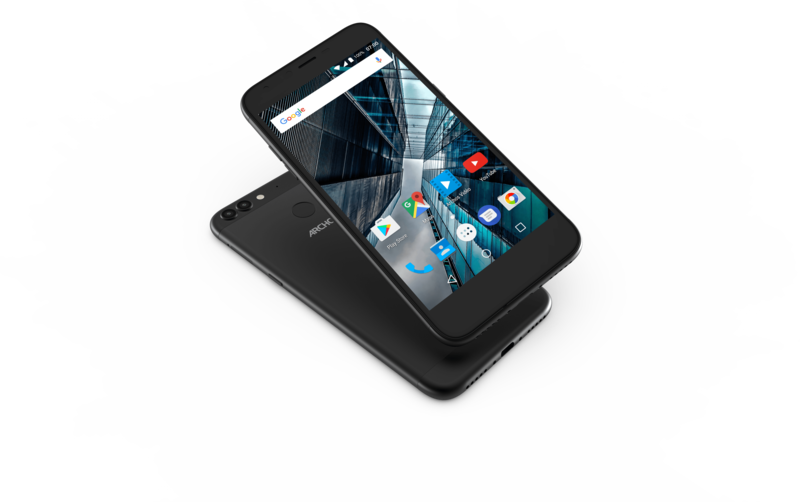 ARCHOS unveils the ARCHOS 50 Graphite and the ARCHOS 55 Graphite smartphones, providing users with a true combination of latest technologies for enhanced functionalities: two cameras, 13MP + 2MP on the back and 5MP on the front, a fingerprint sensor, a USB-C port and Google Android Nougat. The smartphones will be demonstrated at MWC both models will be available in June 2017. With its Graphite range, ARCHOS puts at users’ disposal what they expect: larger screens, fast authentication, high-speed mobile Internet connection, access to fancy apps, photo and videos to share on social networks, rapid charge for an ease of use anytime. In its extra slim Aluminium unibody frame design (7.8mm thick), the ARCHOS 55 Graphite packs a large 5.5” IPS Full Lamination HD screen with a 2.5D contoured edge, making it comfortable for heavy multimedia users to view their favourite content. It flaunts a Mediatek MT6737 Quad-Core 1.5GHz chipset, 2 GB of RAM, 16 GB of internal storage (expandable up to 128 GB via a microSD slot). The ARCHOS 55 Graphite embeds two cameras: 13MP with autofocus and LED flash + 2MP on the back and 5MP on the front. Its dual-lens camera system enables a sharper image with more details as well as ultra-wide angle and shallow depth of field (Bokeh) modes, for capturing and sharing life best moments. Its ultra-responsive fingerprint sensor unlocks the smartphone in less than 0.3 of a second, with the ability to save up to five different fingerprints, not need to worry how you grab it. The ARCHOS 55 Graphite contains two SIM slots and allows fast downloads and rapid data transfer via its 4G/LTE connectivity. In addition to its 3000 mAh Li-Ion battery, the ARCHOS 55 Graphite benefits from a super-fast charge, thanks to the micro USB-C adaptor. Its battery life is also optimisable via the extending features of Doze 2.0 brought by Google latest Android release, Nougat. It runs Google Android 7.0 (Nougat) in its purest release, with a bunch of new features: split-screen mode, quick reply to notifications, and revamped settings and toggle menus. It gives complete access to the Google Play Store and its millions of apps, games and books. A lighter version, the ARCHOS 50 Graphite, with a 5.0” IPS HD screen + 2.5D, 1 GB of RAM, 16 GB of internal storage (expandable up to 128 GB via microSD slot) will also be made available. Exact specifications and availability might vary by country. They will be specified when the smartphones are launched, in June 2017.